Group retirements and savings (GRS) plans can be included in your group benefits package. Having multiple individuals pool resources on a single saving plan can provide more financial security and lower fees for your retirement plan. Work towards your retirement goals as a team with GRS benefits! If you are interested in the benefits of a group retirement and savings plan, contact Puhl Employee Benefits. Our professional approach and years of industry experience make us the perfect choice for your group retirement and saving needs. Call or email Puhl Employee Benefits today for more GRS information! What Is Group Retirement and Savings (GRS)? GRS benefits are a form or retirement savings plan that pools fees and contributions from a number of individuals. This pooled form of investment creates more buying power and financial security for your plan, which creates lower fees for the plan. Group Retirement & Savings Plans can be a very beneficial aspect of your group benefits and wellness plan. If you have any questions GRS benefits contact Puhl Employee Benefits today! You can trust all your GRS and other group benefit needs to the experts at Puhl Employee Benefits. We have experience helping clients and businesses owners with their group benefits needs, finding the plans that match their needs and budget. Our team is here to make sure your group retirement savings needs are met, and that your employees receive the benefits they require. Let us help you to ensure your enjoyable and comfortable retirement. 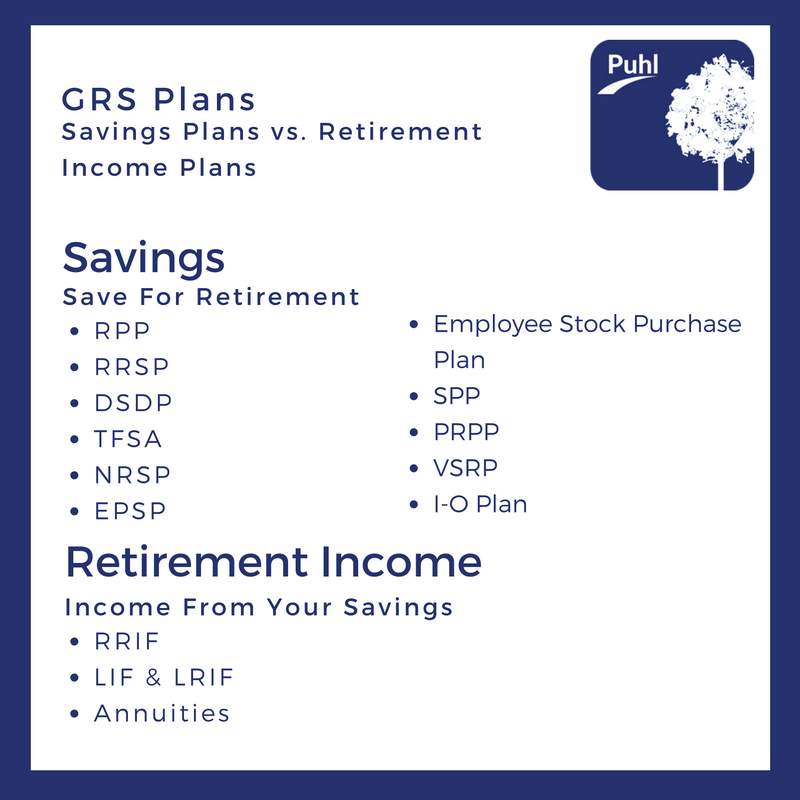 Contact Puhl employee Benefits today to learn more about GRS benefits! A Great-West Life group retirement and savings plan offered by Puhl Employee benefits can be customized to meet your specific budgets and retirement goals. Registered Pension Plan (RPP) – a retirement saving plan set up by and employer for their employees, Group Registered Pension Plans are available as a retirement saving plan option. Registered Retirement Savings Plan (RRSP) – a group retirement savings plan (Group RRSP) that established with the Canadian Government. Deferred Profit Sharing Plan (DPSP) – a profit sharing plan for an employer to share business profits with employees. Tax-Free Savings Account (TFSA) – a tax-free saving account. Non-registered Savings Plan (NRSP) – additional retirement savings, on top of your existing plan. Employee Profit Sharing (EPSP) – employer pays into an account to share company profits. Employee Stock Purchase Plan – employees can purchase percentages of their company. Simplifies Pension Plan (SPP) – Flexible ad-hoc contributions. Only in Montreal & Quebec. Pooled Registered Pension Plan (PRPP) – a pooled savings plan for employees to do not have access to a workplace pension plan. Voluntary Retirement Saving Plan (VRSP) – form of PRPP only offer in Quebec. Investment-Only Plan (I-O Plan) – Professionally advised investment plan. Registered Retirement Income Fund (RRIF) – generate income from your RRSP. Life Income Fund & Licked-In Retirement income Fund (LRIF) – generate income from a locked-in retirement savings account. Annuities – guaranteed lump sum over specified time period, for a single lump-sum payment.